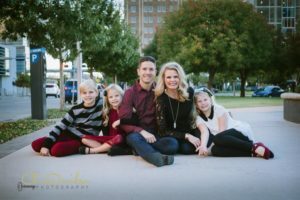 Junior League of Oklahoma City preferred active member, Erin Engelke, contributed this week’s guest post. Growing up in a small town in Idaho, my parents taught me the value of serving others and modeled that themselves, eventually becoming foster parents to several children over the years. I have such vivid, wonderful and sometimes comical memories of being a foster sibling and it was an experience that prompted me to look for ways to serve foster children as an adult. Amazingly, it wasn’t until I became a member of the Junior League of Oklahoma City, however, that I was able to reengage that memory while serving at Super Saturdays with Sunbeam Family Services, an organization who at the time provided therapeutic foster care to high needs children. I found such joy in getting to interact with foster children again and do so right in my own community! This truly is the beauty of the Junior League – exposing our members to people and places that we would otherwise likely never experience, while also expanding our leadership and community service skills through in-League opportunities. Along with my community placements with the Pauline Mayer Shelter Birthday Parties and Sunbeam Family Services, I loved my in-League placements, leading the effort to redesign and rebrand the League Link magazine years ago as well as serve on the Nominating Committee. 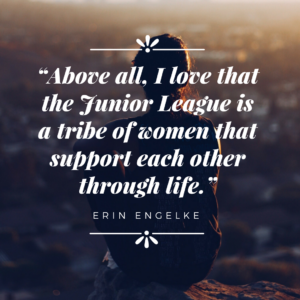 Above all, I love that the Junior League is a tribe of women that support each other through life. I’ll never forget working the seemingly long hours in the Remarkable Shop with my provisional sisters…mostly laughing at the amount of dust we were inhaling but also being there for each other when we had personal hurdles to overcome. For me, it was struggling to have a baby and even experiencing a miscarriage during the time I was a provisional. As it turned out, there was another provisional living with the pain of infertility and we were able to cry together, build each other up and find hope in each moment. What a gift! The Junior League of Oklahoma City continues to be a vibrant part of my life today as I now work for the very organization, Sunbeam Family Services, where I began my Junior League career more than a decade ago. Even better, I get to work alongside Junior League volunteers at the monthly Family Fitness Night community placement at Educare. As a transplant to Oklahoma nearly 20 years ago, I’ve found a home in Oklahoma City and that mostly came through the relationships I developed in the Junior League and through this amazing community.